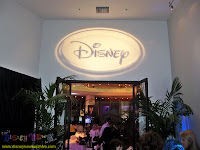 FULL DISCLOSURE: A few weeks ago, I attended a "Bloggers' Night" reception in Hollywood hosted by the good people at the Disney Interactive Media Group. They plied my friends and I with free food and beverages and allowed us to play some of their new and upcoming video game releases. This article has in no way been influenced by the extraordinary hospitality and generous gifts we received that night. So far as you know. 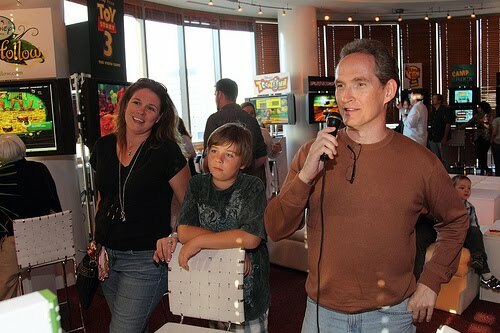 I'll be the first to admit my video game playing experience is somewhat limited, so when you get invited to a video game event, it's always good to bring an 11-year old with you. My friend's son Shawn knows his stuff. 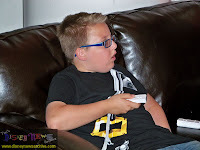 He speaks fluent Xbox, PS3 and Wii and recently had a Nintendo DS surgically attached to his hands. Not that I was able to consult with Shawn at the party. Once he hit the games, we pretty much lost him for the night. How far he got sucked down the rabbit hole, though, was helpful in assessing some of the games. So thanks, Shawn, for being my unwitting accomplice. 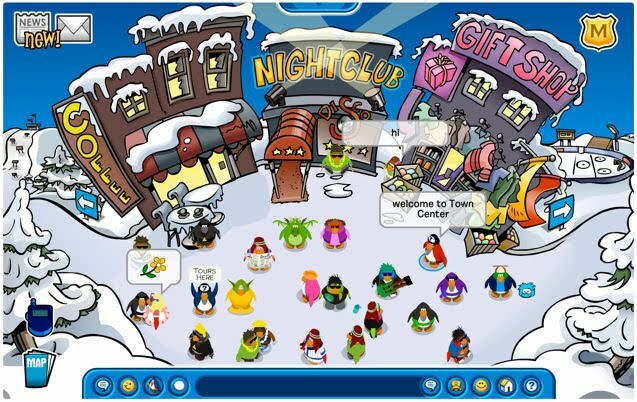 "Club Penguin" was started by a Canadian company in 2005 as an online community where kids could play and interact in a safe, moderated, ad-free environment. 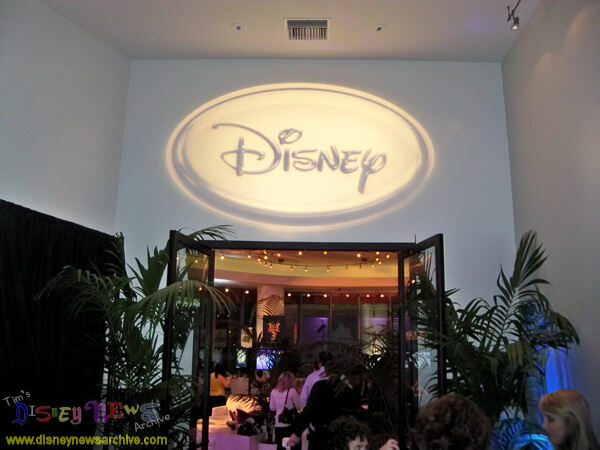 Disney acquired it in 2007 and the site has continued to grow since. Players take on penguin personae in a perpetual winter wonderland full of games and activities. You can join snowball fights and ice hockey games, act in penguin plays, make pizzas and even decorate your own custom igloo. The official Disney PR plays up how "Club Penguin" encourages kids to use their imagination and improve their reading and math skills. Blah blah blah. I just think the game's friggin' cute. I want an igloo . . . and a puffle . . . and coins, lots of coins. Apparently Shawn's kinda familiar with "Club Penguin." 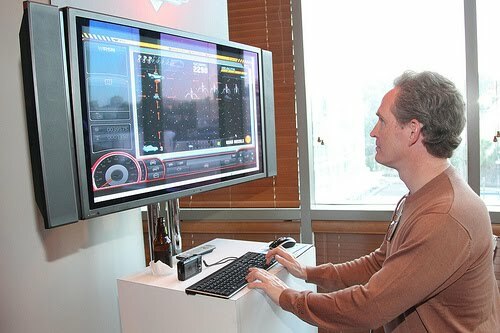 He spent the first half hour of the evening on it, showing the game host how to play. Don't think for a moment she was showing him anything. Basic "Club Penguin" game play is free at www.clubpenguin.com. Full membership, with access to more games, activities and stuff, costs $5.95/month. After making a splash with the "Hannah Montana"/"High School Musical" crowd, Disney is finally releasing a version of their popular karaoke game "Sing It" for the rest of us. 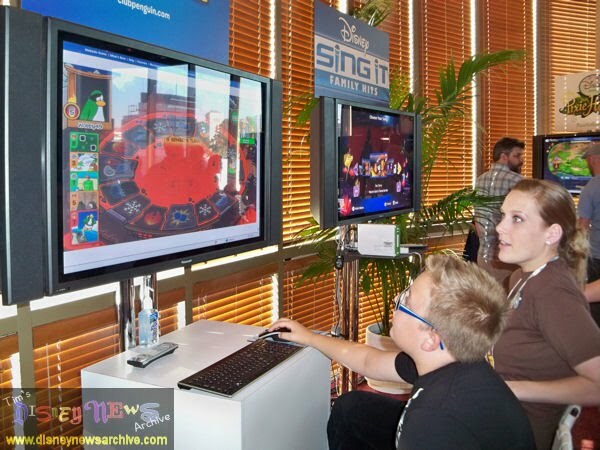 "Sing It: Family Hits" features 30 songs from Disney's vast motion picture music library for the Wii and PS3. It'll be available in early August. I have one belief when it comes to karaoke. If you can't sing well, sing loud. I sing loud. Especially on a night like this when I'm fighting a cold and my voice sounds something like Bea Arthur's. It didn't make me shy away from the mike, though. I took on "Cruella De Vil" (if my singing doesn't scare you, no evil thing will) and "Supercalifragilisticexpialidocious" (I was confident enough in my Disney geekery to sing Mary Poppins' part). For my finale, I absolutely tore up "Under the Sea." That's how I roll. The game scores you higher for timing the lyrics right and being on key. Anika Noni Rose ("The Princess and the Frog") is even there in-game to give you singing tips. This all seemed pretty irrelevant to me. If I could sing well, I'd be on "American Idol." At home or at a party with my fellow Disney friends, I just want to belt out songs and have fun. It won't score me any extra points, but, hey, you can't put a value on style. We lost Shawn on this one for a lonnnnggg time, so, for that alone I'm giving it a thumbs-up. 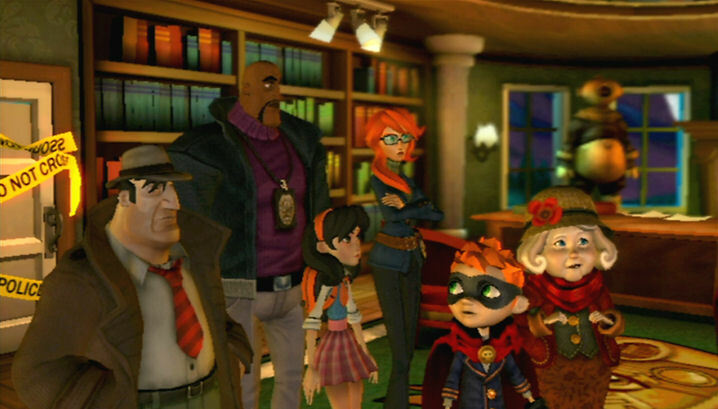 "Guilty Party" is a family-friendly whodunnit game that looks and feels a lot like a video version of "Clue." 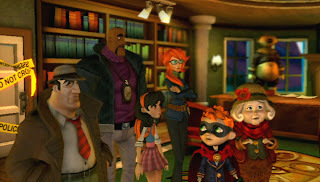 Players are enlisted as detectives for the Dickens Detective Agency to track down the elusive criminal mastermind Mr. Valentine. Working together, you search crime scenes, interrogate suspects and unlock clues to solve the mystery. To help you, your game controller can be used as a magnifying glass, a flashlight, a lock pick and other tools of the trade. And once the mystery is solved, you can start over again, because the game never plays the same way twice. "Guilty Party" will be available for the Wii at the end of August. I'll get to the point. 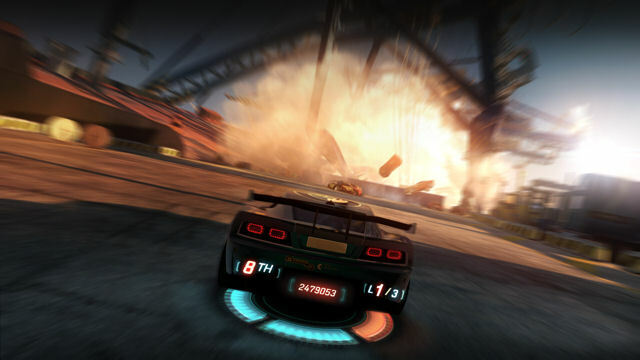 In "Split/Second," you drive ultra-cool cars really fast and blow stuff up. The first time I played it, I mercilessly beat a nine-year old into oblivion. Yeah, I like this game. "Split/Second" is available now for the Xbox, PS3 and PC. It features impressive graphics, fast driving action and lots of explosions as you race through a "made-for-TV city built for destruction" (the back story, apparently, is that you're part of a reality show). As good as the console versions are, though, it doesn't work as well as a mobile app. I've been playing it on my iPhone the last few days, and despite looking great with decent game play, it lags terribly at times and crashes for no reason. The game has potential, but Disney needs to work the bugs out before it's a top-notch iPhone app. The cutest little town in Carburetor County comes alive in Disney's newest virtual community, the "World of Cars Online." In open beta testing right now (which means it's not quite finished, but you can kinda-sorta play it), the game lets you create your own car-toon character and navigate the streets of Radiator Springs made famous in Pixar's "Cars." You can race and chat with other players, build and customize your own personal garage home, play games, and go on adventures with resident characters like Lightning McQueen, Mater, Fillmore and Sarge. Navigating your car on and off road takes some getting used to, as I struggled to using both a computer mouse and arrow keys to steer. I actually found it easier to use the touch pad on my laptop--I've even won a few races that way. The side games are fun. My favorite is "Lightning Storm," an old-school shooter that feels like "Galaga Meets Defender Meets Mr. Goodwrench." It's also a hoot (well, a honk, actually) to head out to Fillmore's Fields for some playful tractor tipping. Moooooo! 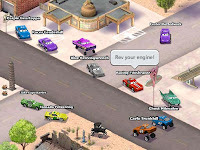 During beta testing, the "World of Cars Online" is free to play at www.worldofcars.com. When it's ready to officially launch later this year, you can continue to play a scaled down version of the game for free, or purchase a "sponsorship" for $5.95/month and get full access to all the bells and whistles including exclusive customizations for your vehicle and the opportunity to race online in the Piston Cup Series. 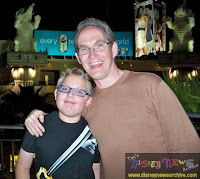 "Epic Mickey" looks like the coolest thing Mickey Mouse has done in decades. It's already on my Christmas list. That's about it for now. Am I forgetting anything? Oh yeah, has anyone seen Shawn?